2019 may be the year of flexible mobile devices, but judging by a couple of announcements from China this week, it appears that we may also be expecting the disappearance of holes and ports on smartphones. Following yesterday's Meizu Zero, today Vivo has announced its latest concept 5G device, the APEX 2019, which is yet another smartphone with almost no holes. I say "almost" because there's still a tiny microphone slit below the screen, but other than that, you won't find any USB port, speaker grill or SIM tray around this shiny slab of glass. In fact, we should talk about this "Super Unibody" as well. It's made of "Curved-Surface Waterdrop Glass," with the "waterdrop" part referring to the extra thickness around the edges, which serves as an alternative to the usual metallic mid-frame while also offering a cool translucent look. That said, I do wonder how well this will survive drops, especially when compared to Meizu's ceramic offering. To create this glass unibody with uneven thickness, it requires a tedious process involving both heat bending and CNC machining, which likely won't come cheap. Part of this glass also serves as a set of three pressure-sensitive capacitive buttons -- think HTC U12+ but with glass instead of metal -- along the right hand side, and these will presumably be mapped for toggling power and volume. Another unique feature here is the full-display fingerprint scanner. Just last week, Oppo and Xiaomi talked about possibly featuring a large-area in-display fingerprint reader in their upcoming phones, but if Vivo's claim is to be trusted, it appears that the APEX 2019 may be one step ahead of the game. Not only will this make unlocking more convenient, but it'll also let you unlock and toggle an app with just one tap -- so long as the app icon is made available on the unlock screen for you to press on. Much like the Meizu Zero, Vivo's new APEX will be relying on its screen -- our money's on OLED -- to act as a loudspeaker. Likewise with the invisible earpiece. As for USB connectivity, this will be substituted by a "MagPort" magnetic pogo pin connector to go towards the bottom side on the back. While this doesn't sound as cool as Meizu's proposed wireless USB feature, it's far more practical and easier to execute. And most importantly, there's eSIM to replace the SIM tray. Even though the APEX 2019 is just a concept phone, Vivo still provided some detailed specs, including a Qualcomm Snapdragon 855 chipset with an unspecified 5G modem, a whopping 12GB of RAM plus 512GB of storage, and a 12MP + 13MP dual camera setup on the back. Funnily enough, there's no front camera here, which is ironic given how the original APEX's main selling point was its pop-up selfie camera. At least we know for sure that there's no way this new APEX will end up in the market as-is, despite its good looks and potentially great water resistance. Vivo already showed off actual devices based on this concept at its Beijing event, and we'll be able to take a closer look at MWC next month. Given how the first APEX eventually evolved into the NEX S, chances are this new version will see a similar fate, so long as it finds a way to integrate a front-facing camera to complete the puzzle. The Chinese are now innovating at speed, and have even delivered on what Apple actually admitted was their vision for the iPhone, for it to be port free. IE, just screen. Where China is now in electronics is where Japan was with cars in the 1980s. The 70s Japanese cars were rubbish, but they then learned to innovate and do QA properly from the 80s onwards, and, well, look who JD Power & Associates votes best auto brand year in year out? Toyota/Lexus/Nissan/Infiniti etc. Will be the same with Chinese electronics not long from now, once they start producing computers too so there's an ecosystem. I find the total lack of ports...courageous. I predict this won't be the last portless phone hitting the market in the near future. glass on the backs of phones was a mistake and continues to be a mistake. These no port or a small pin type mag connector phones just make no sense to me. it's taking things to far. phones screw up. How do you reset a locked phone with no buttons? How about the OS getting screwed up and you need to do a reinstall? Ops, can't plug it in. There's three capacitive touch buttons. But it does not say how you would turn if on if it was powered off. Since this IS a concept, I’m absolutely certain that if it went into full production, they would have ways of mitigating the issues you stated. It seems that their "experiments" are paying off royality in designs/RD. It's sad that Apple/LG are playing catch-up to these third-grade companies. Vivio, Oppo, etc aren't third-grade/third-rate companies. In fact Oppo and it's brands are pretty high end in general. Most of BBK Electronics' companies in general are very solid phone manufacturer. Tim Cook has failed Apple's innovation. I love this phone. But, my gosh, no front camera? Who cares? It's not available in the US. How does this thing shed heat? 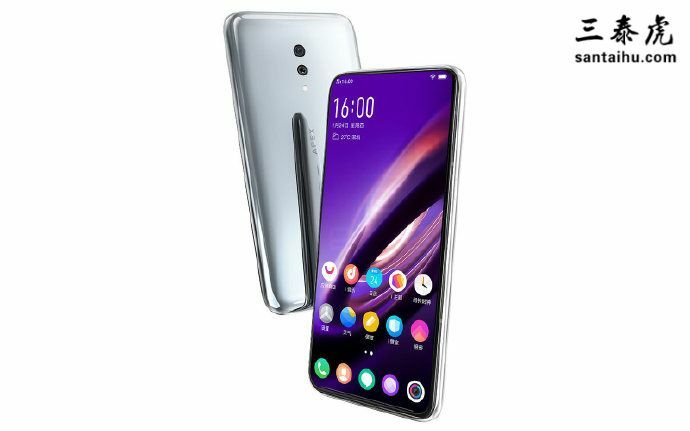 In the future china will take over the smartphone market they are making some very beautiful phones that are also cheap. Yeah I'd never trust a Chinese phone. It needs a headphone jack. Looks like impossible to repair when broken. To be fair you can see this is where the smartphone world is going.